Los Angeles, often abbreviated to simply 'LA', is a complex city, known for its golden beaches, superb surfing conditions and numerous movie stars. Divided into many districts, some of the most famous areas of Los Angeles include Hollywood, which is full of movie-related tourist attractions, and LA's Beach district, where you will find Malibu Beach amongst others. With so many districts and suburbs, Los Angeles offers a large number of tourist information outlets, with the most noteworthy including the California Welcome Center on Beverly Boulevard, in West Hollywood. Also in this part of LA is the West Hollywood Marketing and Visitors Bureau on Melrose Avenue, close to the legendary Sunset Strip. Further tourism advice is available at the Santa Monica Visitors Center on the second floor of the Santa Monica Place Mall, on the 3rd Street Promenade, and at the Downtown Visitors Center on South Figueroa Street. 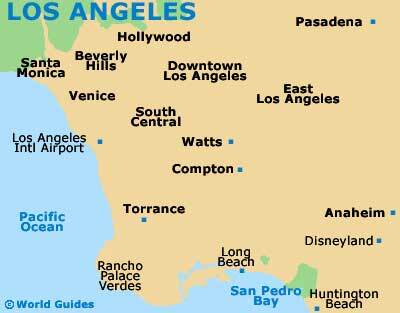 The districts of Los Angeles each come with their very own selection of hotels, which vary greatly in price. Hotels are plentiful in downtown's central business district (CBD), Hollywood, West LA - which includes the exclusive Beverly Hills and Bel Air neighborhoods, and around the numerous beaches along the Pacific coast. There are also several popular hotels close to Los Angeles International Airport (LAX), which is situated to the southwest of the city center and in the Playa Del Rey area, near to the Dockweiler State Beach. More information about Los Angeles Hotels. Los Angeles has many splendid tourist attractions, including Dodger Stadium - with regular baseball games and a capacity of over 50,000 spectators; the Walt Disney Concert Hall - an extravagant building where many musical events in LA are held; CBS Television City - home to major Californian television productions, with free tickets for shows such as 'The Late, Late Show'; the Hollywood Forever Cemetery - where a number of world-famous Hollywood celebrities have been laid to rest; Los Angeles Zoo - containing thousands of animals and landscaped botanical gardens; Paramount Pictures - Hollywood's longest running film studios with regular guided tours; and the famous Hollywood Sign - symbolizing the hopes and dreams of many hopeful and struggling actors. Other main tourist attractions in Los Angeles include the First Interstate World Center - the tallest structure in the area, featured in the Hollywood blockbuster 'Independence Day'; the Angelus Temple - with a large dome, organ and regular spiritual services; the Watts Towers - one of the most unique and creative landmarks in Los Angles; the Griffith Observatory - an impressive Art Deco observatory built in the 1930s; the Wells Fargo Center - shiny towers forming an iconic sight; Union Station - appearing in many Hollywood films in the 1940s; the Crystal Cathedral - containing a vast interior seating up to 3,000 people and a striking glass tower; and Elysian Park - one of the largest parks in LA, with many scenic walking trails. 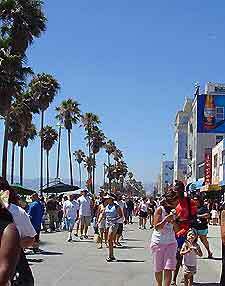 More information about Los Angeles Tourist Attractions and Los Angeles Landmarks. Los Angeles also has many excellent museums, such as the much-celebrated Getty Museum - not to be missed, featuring large collections of pre-20th century paintings; the California Science Center - educational and fun, full of science information and hands-on exhibits; the Peterson Automotive Museum - with more than 150 vehicles on display, including classics cars and Cadillacs; the Los Angeles County Museum of Art (LACMA) - one of America's most highly regarded art museums, with important Renaissance paintings; the Museum of Contemporary Art - full of modern art, with information about the various paintings and sculptures; and the Fisher Gallery - operating in LA for more than 60 years, with a collection of contemporary and traditional art. 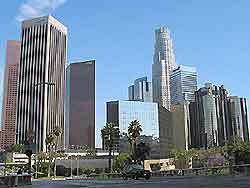 More information about Los Angeles Museums and Los Angeles Art Galleries. Tourist attractions located nearby Los Angeles include Malibu Beach - a favorite hangout often monopolized by LA's rich and famous; Santa Monica Beach - within easy reach, featuring a popular pier, seafood restaurants and numerous palm trees; Venice Beach - an especially lively beach, including the famous Ocean Front Walk, where street entertainers regularly perform; Universal Studios - one of the main tourist attractions nearby Los Angeles, with film sets, incredible special effects and movie-themed rides; and Warner Bros. Studios - with information about technical aspects of film making and enjoyable guided tours. More information about Los Angeles Attractions Nearby.